Happy friday folks! And just like that February is almost over and what a crazy month it's been! New York Fashion Week, London Fashion Week, monster storm on the East coast, the launch of Vine App by Twitter, Chinese New Year, Valentine's Day and how can we forget Taco Bell's viva young commercial during the Superbowl. All of this in the shortest month of the year. I'm still reveling from my birthday celebrations and quite certain that I've already met my cake quota for the year. So tell me readers, how did you spend your February? Absolutely ecstatic when I received this little ray of sunshine in the mail from my mum and sister. Doesn't this butter yellow colour just conjur up images of cupcakes and lemon meringue? I can't help but envision trays and trays of pretty pastel cupcakes scattered across my kitchen floor while I'm standing by my new mixer with a spatula in one hand and the tail of my Marchesa in the other. Is it obvious how much of a Tim Walker fan I am? As if splurging on a little birthday treat wasn't enough. I was pleasantly surprised when I opened my mail to find the sweetest little thank you note from the wonderful staff at Nordies. 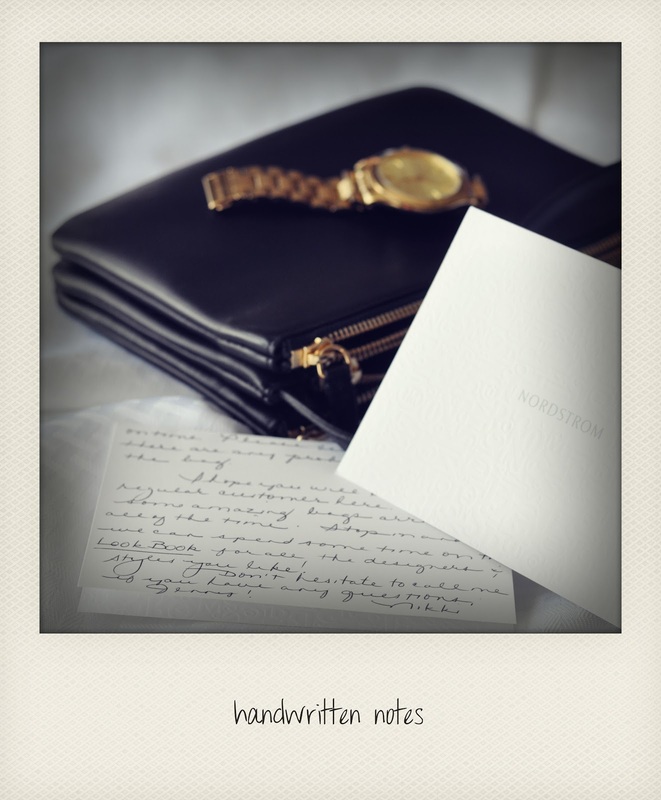 That just goes to show, true style stems from the heart. 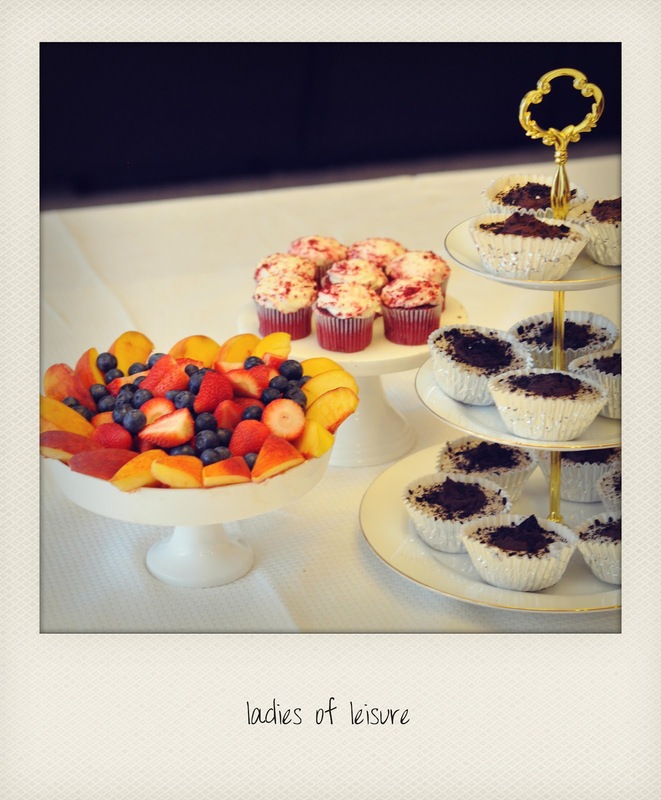 Throwing my first brunch of the year with ample sweet treats and sushi. None of which are very brunchy but together makes up the perfect feast, a healthy main followed by decadent dessert. Oh and let's not forget the most important component of brunch- champagne! I don't know why people frown upon child labour. 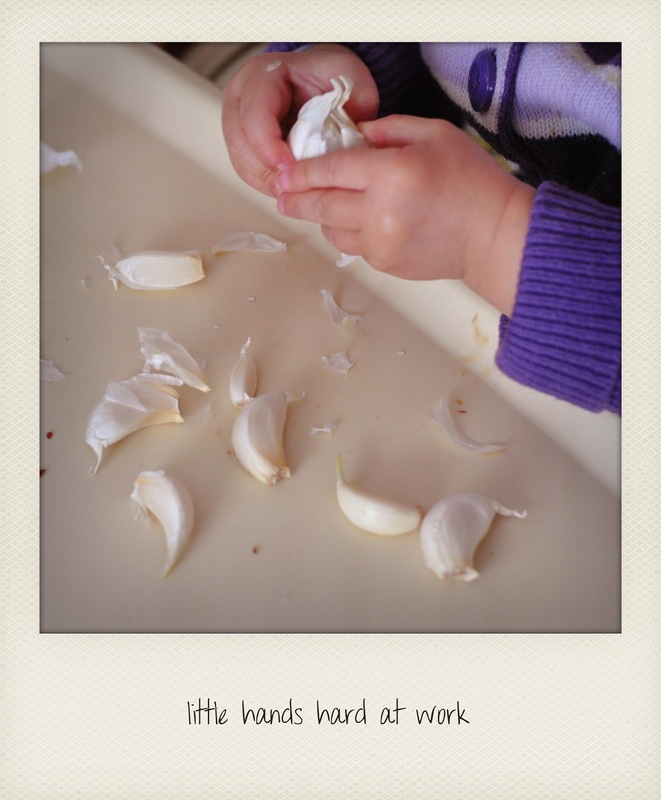 Little hands are wonderful for peeling garlic! These little pungent balls of fun have been wonderful at keeping my kids entertained for no end. All of a sudden my little energizer bunnies are transformed into focused little workers. By now every blogger I know has now some form of Prabal Gurung for Target in their closet. When you look at it you understand why it was such a popular collection. Punchy graphics in wearable styles at an affordable price, this may just be the best designer collab Target has put together. For me, the best part was the shoes. Every style was a nod to it's designer doppleganger making it affordable to achieve runway looks for the every girl. I only wish they didn't sell out so fast. That mixer is to die for! I love that shade of yellow. When I finally get my own apartment, I want to save up for a KitchenAid! 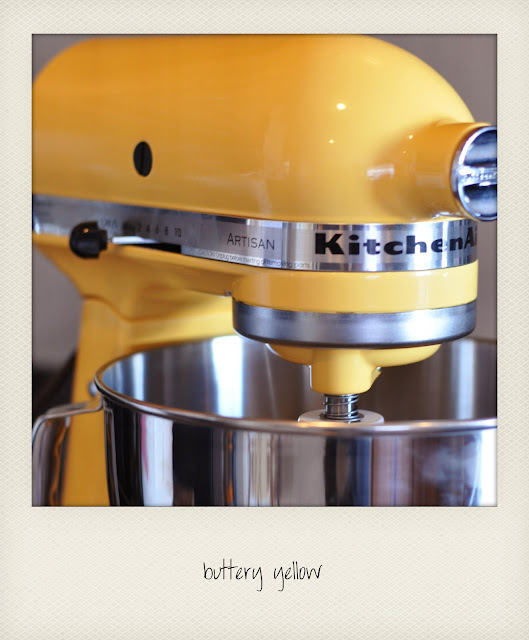 I can't help it–I'm unapologetically in love with that KitchenAid! Mine is just a boring old white, and while I do love it, the yellow is just perfect! And I love the shoes in the Prabal Gurung collab too! I bought two pairs. The clothes I liked but didn't buy any because the shoes I was after more for. haha..
Those cupcakes!!! And that mixer! I am dying to get that mixer, I am hoping that I get one when I get married. Awwww. Mom and sister are so sweet. 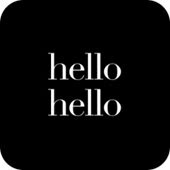 Thank you so much Jenee for checking out my blog. You have such an amazing site yourself. Love you work & will deffinatly be following you on all forms of social media. Now that is one great selection of goodies! I'm loving your mixer. One is still on my wish list! Beautiful photos! The shoes are gorgeous and the cakes look heavenly. Have a great weekend. Your "Fridays Fancies" posts are always my favorite! Your little girls peeling the garlic-too cute! Childhood labor--no problem! haha! So funny! I actually think I'm the only blogger on the planet that didn't pick up something from the Prabal Gurung collection!! The only thing I really liked was the shoes/jewelry, and by the time I got to my target, they were sold out. I have to be honest that I wasn't too crazy about any of the clothes. 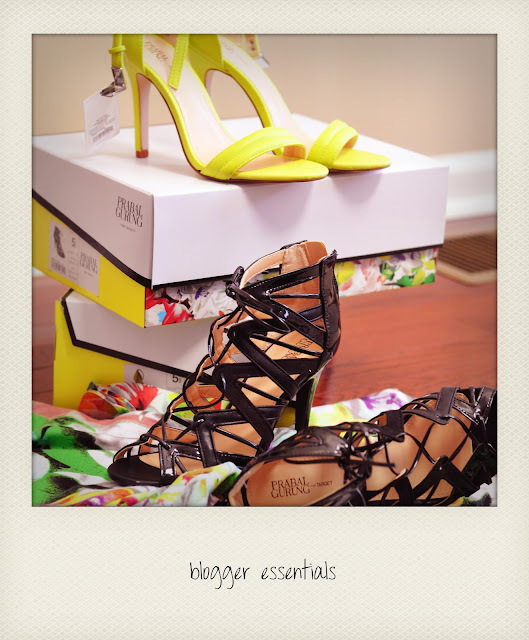 Those neon Prabal Gurung heels are amazing! I'm sad I didn't get the neon heels. I was thinking they were too high, but I think I'll go back in tomorrow and see if they have any left in my size, they are too fab to pass up!! Love the yellow mixer too! Those heels are Amazing! Love the neon ones... sooo fab! I want EVERYTHING in these photos here, including your little one! Your Chloe Trio is what I "need" right now. I don't have a small messenger style bag. As for the KitchenAid. Yup, that's on my list. yup i agreee- for me it was pbs shoes. were u like me and had to buy half a size smaller?! they ran too big for me! i love this post! xO! you had an awesome February! my birthday was last wednesday, so i definitely know about the cake quota deal. hahaha love your new kitchen aid blender. that yellow is awesome! they make the best colors. your mother has great taste. awesome post jenee! i missed out my prabal gurung sandals. love yours!